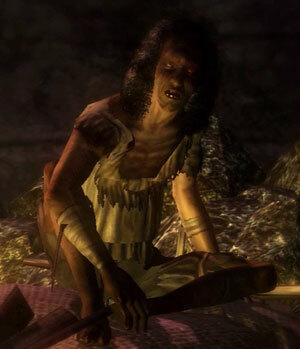 Filthy Man is an NPC in Demon's Souls. Heh heh heh, Hello there! Souls, souls! I trade fine goods for souls! Our little town? Well, heh heh… It's a nice wee place. All those lizard-eyed townsfolk are busy tinkering with stone, and don't bother with old men like meself. Makes life rather easy for me. I can get away with anything! Heh heh heh heh. Thank you, Lord, for this golden opportunity! Heh heh heh. Have you heard about that sparkling lizard? He's not easy to catch, but he's got some fine stones. And I know where his nest is! Oh, I'm sorry, I can't give it away! Heh heh heh heh! Heh heh heh, remember me? I've got plenty o' wares, so bring me plenty o' souls! Heh heh heh, have you heard? Deep below this mine, there's a dragon shrine filled with dragon bones. Well, according to little Scirvir, anyway. I'm not about to go and find out. Those bearbugs scare the living daylights out of me! Heh heh heh, hello. Here to make a deal? Yer want to play, well, you've got to pay. Don't you agree? Heh heh heh… Well all right then. Come back when you actually need sometihing! Heh heh, hello there. Bless yer souls! Where're yer running off to? Heh heh heh, stop with yer messing! What do you think you are doin? You can't get around me easy, so watch yourself!